As we come to the end of our third year it’s a good time to take stock of what has been achieved under the project banner. In the autumn we saw our 90th meadow being sown, with help from His Royal Highness the Prince of Wales, and while it may be too early to know how successful that seeding has been, early signs of germination are good. It can take 5 to 10 years before newly sown meadows properly establish, however reports from meadows seeded in the first two years of the project are very encouraging, with many already showing significant changes. This can be most easily seen in those sites where seeding was focussed in specific areas rather than across the whole. The restoration of Middledown in Somerset is one such example. 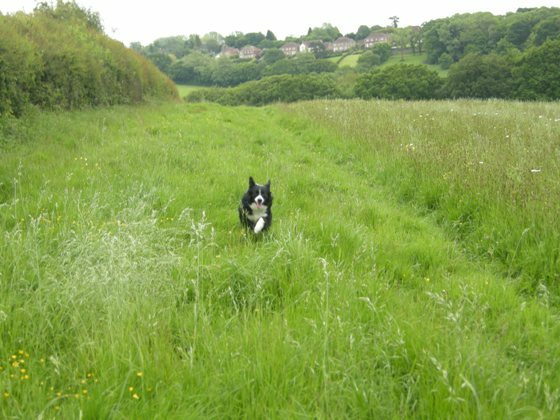 Here, when the Somerset Wildlife Trust arrived in summer 2014 to power harrow and sow the seed they had harvested from their nearby Chancellors Farm reserve, they found rows of cut hay still on site waiting to be collected. As a result they could only harrow and seed the strips between the rows of hay. 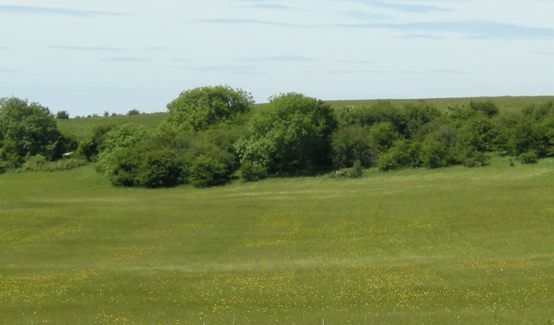 The following summer the meadow was striped with yellow flashes as yellow rattle, eyebright and cat’s ear dominated the seeded areas, while a year later though the action of hay cutting and grazing cattle had started the process of moving more seed around, the continued success of the original seeding was still clear. 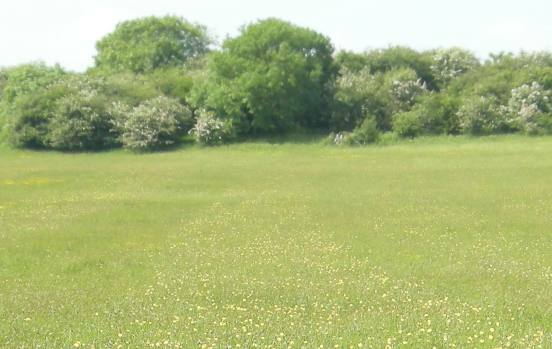 In East Sussex, at one of the first meadows to be seeded under the project, an edge of the meadow beside a hedgerow was deliberately left unsown by local partners the Weald Meadows Initiative to help assess the effect of the works. By May the following year the difference was apparent with the hedgerow strip remaining a uniform green while the rest of the meadow was bursting into life. In time, through the action of casting the hay cut to the side of the mower and through grazing, the wildflowers should slowly spread into the unsown strip too. Understandably with the complexities of nature it hasn’t been perfect across the board. 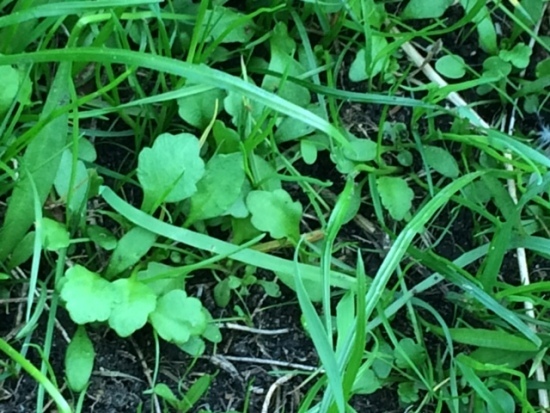 A handful of sites that were unable to get on top of their dock plants ahead of opening up bare ground for seeding have seen a subsequent increase in these troublesome ‘weeds’ making more work for them in the coming year, which is a salutary lesson to potential future meadow makers. 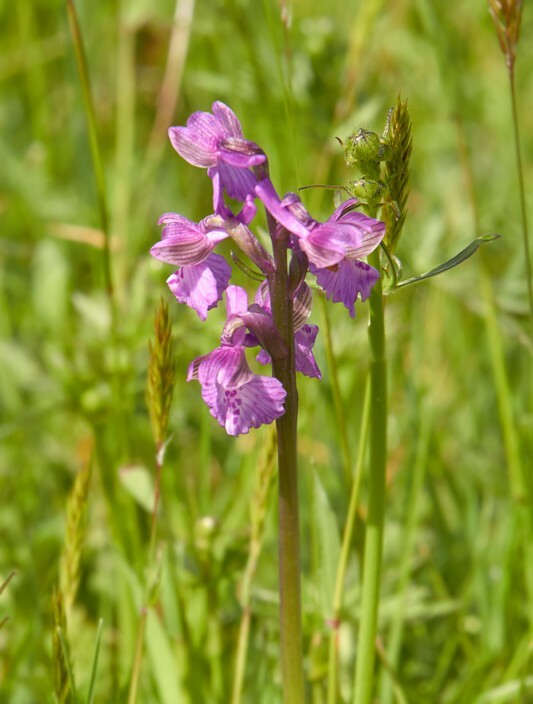 However more pleasant side-effects have been reported elsewhere, including the Monmouthshire and Warwickshire restorations, where green-winged orchids have been newly sighted. These are unlikely to have arrived in the actual seed cast, as orchids typically take a few years to germinate and establish, more likely the act of opening up patches of bare ground to cast seed over has allowed dormant seed to finally flourish. Either way it is a heart-warming result that an iconic meadow plant that has seen such a reduction in numbers over recent years is reappearing. The beauty of meadows as any owner will tell you is that they are constantly changing and throwing up new surprises, whether in the plants flowering or the butterflies and other insects that come to find them. All our new meadow owners have agreed to manage their sites for the long-term and in the coming summers they should continue to get more diverse and colourful year on year. Once again then a big thank you to our funders, our local partners and to the new meadow owners for helping us to bring back meadows to our countryside.